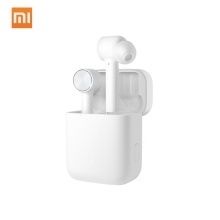 The Xiaomi Mi BT Earphones Air with true wireless design, more lightweight and exquisite compared to the AirDots, smart touch for operation, equipped with charging base with USB Type-C port, ENC noise reduction technology and its built-in infrared optics, which offer improved music or audio listening experience. Moreover, it is compatible with iOS and Android devices both, and supports for smartphone, pad, notebook. – True wireless design, support connecting with BT4.2,enjoying music and phone call within 10m. – Gentle touch for realizing many functions. – Fast BT connection, taking out the earbuds can auto-connect the devices paired. – Equipped with charging base with USB Type-C port, convenient for storage or travelling. – Only 5.8g (single), ergonomic shape well fits your ear, stable and comfortable for wearing. – 7mm neodymium driver + titanium sound chamber, to enhance overall sound quality. – Sensitive microphone, ENC noise reduction technology to cancel the ambient noise. – Built-in infrared optics, automatically paused playback when pulling it out of ears. – Compatible with iOS and Android devices both, support for smartphone, pad, notebook and etc. 1.This Xiaomi Mi BT Earphones Air is Chinese Version. 3.The battery use time and standby time depend on the actual use situation. 4.The BT available connecting range will vary due to the different situation, like obstacles.